Many people in the derby community enjoy watching teams employ various strategies at the start of a jam. You know, how blockers move off of the line or how they position themselves amongst the pack, among other things. Stuff like that. The execution of these strategies include tactics like taking a knee before the start of a jam to force the jammers to start immediately, or deliberately standing around behind the pivot line to stall for time to force a positional advantage. Slow starts and no-starts are something of a hot-button issue in the derby community. Personally, I feel that standing around and doing nothing to get what you want should not be a part of roller derby in any way, shape or form. You may call it strategy, but I call a determent to derby and counter-intuitive to how sports should work. Interestingly enough, however, there’s another sport that has the occasional sequence of strategical inaction, with very close similarities to slow start situations in roller derby. It’s very popular in Europe and is also an Olympic sport. In this sport, teams or individuals compete in various kinds of races in order to get the most points, to see who can make the fastest time over a distance, or be flat-out faster in a heads-up three-lap sprint. During some occasions, riders will come to a dead stop in the middle of the track, sometimes not moving for up to a minute or more at a time. What is it? Think banked track roller derby, only supersized and with bicycles. Track cycling. 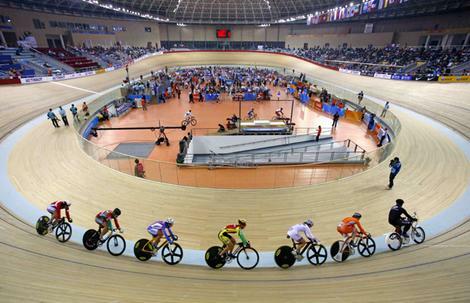 It’s a sport featuring athletes in tight shorts racing around on a highly-banked oval track (just like roller derby!) on highly specialized bicycles that are worth more than a new car and can go faster than an old car. Track cycling has many variants and disciplines, but the one I’ll be singling out is the sprint race, which is about as simple as a concept as it comes: Three laps, two participants, one winner. Fastest one wins, right? Actually, no. Although the track sprint is an extremely simple concept, there’s some deep, deep strategy and gamesmanship in play. We’ll get to that in a moment. But believe it or not, we can look to the sprint and its extreme tactics to compare and analyze how similar tactics in roller derby stack up—and why people cheer inaction in cycling and boo inaction in roller derby. If you’ll pardon the vernacular, a crash course in sprint cycling strategy is first required for anything to make sense beyond this point. If you’ll stick with me, you’re going to learn something interesting about roller derby by the time we’re done. Allow me to assume that you don’t know anything about sprint cycling on the banked track. In brief, it’s an individual sport that pits two riders against each other on a steeply banked cycling track, known as a velodrome. Riders begin from a standing start and compete over three laps. The first one to cross the finish line at the end of the race, wins. On paper, it’s as simple as it sounds. An exciting finish. But hold on a moment… wasn’t that start slow and boring? That can’t be right. Why were these sprinters so lackadaisical off of the line? This is a sprint race! It’s all about speed! Shouldn’t sprint racing over three laps include, you know, three laps of racing at sprint speeds? What sense does it make to go slow in a sprint race? It makes perfect sense, actually. The first lap or two of a sprint race is actually a setup phase for the all-important dash to the line on the last lap, or bell lap as it’s known in cycling vernacular. Both riders use these initial laps to conserve energy and feel each other out, to see who will blink first and kick it into top speed. If the sprint starts early in the race, a rider runs the risk of tiring out and risk getting passed at the finish. If it begins toward the end of the race, the man up front will have plenty of left energy to fend off an attack and hold his position. Positioning is also a crucial aspect of sprinting. All other things being equal, the best position to be in during the last lap is directly behind the lead rider. This gives the trailing rider the aerodynamic advantage of drafting, or slipstreaming, allowing them to attain higher speeds with less effort due to the forward rider punching a hole through the air. This is the ideal situation on the last lap, where the stamina and speed advantage provides the opportunity to slingshot around the lead rider the finish line. You can see a perfect execution of this strategy in this video. The goal in a sprint race is to find the sweetest combination of positioning, timing, and outright stamina and speed to win the race at the line. There are lots of other strategical things to consider, but that’s sprint cycling strategy in a nutshell. For the purposes of comparing sprint cycling to roller derby there’s just one thing you need to keep in mind: Even though it’s a race to get to the finish line first, more often than not, the one that is in the best position to do that is the one that’s not in first when the last lap begins. Kind of blows your mind, doesn’t it? This concept produces an interesting conflict. 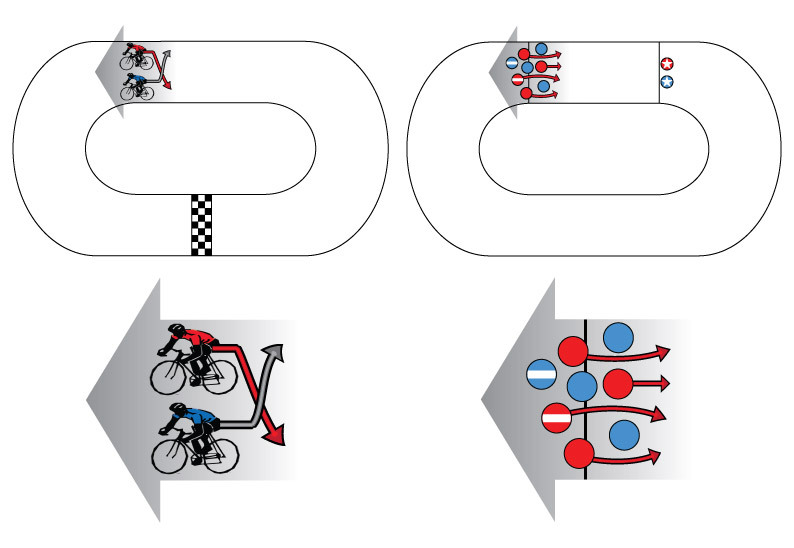 Both riders in a sprint race need to move forward to get to the line first and win the race, but at the same time, both riders usually want to move behind one another (backwards relative to the opponent) to gain an advantageous position, one that can give them a great chance at winning the race. During the initial laps, the rider in the rear would have little reason to pass the rider up front since that would take him out of a good positional advantage. The rider in the front will want to try to get behind the rider in the rear, but since he can’t move backwards on the track he’ll want to start things slow to see what the other rider is doing. Hence, a big reason why there are slow starts during a sprint race. This backwards-forwards conflict also appears in roller derby. At the start of a jam, a situation can occur where a team isn’t interested in leaving the pivot line at the start of a jam. This may be because they want to burn off penalty time or game clock, gain a positional advantage in the pack, or other reasons they deem advantageous. Effectively, they want to go backwards relative to the skaters on the other team, so they can get behind them. I explained and diagrammed this concept in my Pack No-Starts: An Analysis and Commendation article. However, both teams know that the the pack will eventually need to move forward (either together over the pivot line or via a team pushing forward to force a split pack start) to launch the jammers. The conflict here is that even though the pack needs to move forward, one (or both) teams may want their skaters to stay behind, or in other words, go backwards relative to the opponent. This seems as if this would be a situation unique to derby, in a few “perfect storm” scenarios that only crop up once in a blue moon. Of course, if that were the case, I’d be wasting your time talking to you about cycling. Surprisingly, the exact same situation can happen in track sprinting. Bwhaaa?? Why is the crowd cheering and clapping and stomping? What’s with that cool spotlight shining down on two people doing nothing? How can this inaction be so exciting to these people, when very similar inactions in roller derby causes people to boo? The reactions were different even though the (in)actions appeared to be the same. What gives? A broader look at what’s happening is necessary. Consider the two cyclists coming to a complete standstill on the track and compare them to two teams in a derby pack remaining at a complete standstill at the beginning of jam. Even though the goals of each sport are different (cycling: get the finish line first; derby: get your jammer through the pack), the positioning aspects are exactly the same (needing to go forward and wanting to go backwards at the same time) when it comes to these specific circumstances. When everyone needs to go forward and wants to go backward, you get slow or no movement. Although the sports are different, this conflict of positioning is exactly the same during certain situations. On an even broader scale, cycling and roller derby are both sporting competitions. All sports have the same underlying traits that make them competitive and entertaining. In these very similar strategic situations, the execution is what makes them different. One sport executes slowness and non-movement with skill and an element of risk; the other one doesn’t. Among many others, skill and risk are core traits that are prevalent in all competitive sports. If a sport doesn’t have skillful athletes and/or players that don’t take risks, then you’d probably have a terribly boring sport. Skill – It is not easy to come to a dead stop on a bicycle and stay on two wheels without putting a foot down. If you have a bike, get on it and try. You can’t use your brakes, since track sprinters don’t have them. Now try doing continuously it for a minute or two, keeping your feet only on the pedals the entire time. Oh yeah, and they’re also doing it on a steeply banked track with rail-thin tires to balance on. (Forgot to mention that part.) A stunt like stopping dead on a velodrome track can only work if you know what you’re doing, so it goes without saying that cyclists who can do it are very, very good. Risk – Stalling during a sprint race is a double-edged sword. If done correctly, the rearward rider will earn a huge positional advantage going into the sprint lap. If it backfires, the other rider will simply pull away, as seen in the video. There’s also a risk of a rider losing his balance and needing to roll forward, giving away the advantage. Even more than that, it’s possible to lose it completely and fall onto the track—riders’ feet are locked into the pedals, so they can’t use their feet for balance—which would give away an easy victory. It’s not a strategy card that should be played lightly, in other words. Risk – The upside to a team stalling at the start is that they may get an advantageous pack position when the jammers start and/or make penalties inconsequential by burning off box time. The downside? There isn’t one, really. There’s no way for it to backfire because there’s nothing the other team can do to prevent the stalling team from stalling once the jam starts. If the other team forces the split pack, they’re handing a big positional advantage to the stalling team. So not only is there no risk to a team stalling at the line, it seems that in some situations, it’s very risky for a team to not stall at the start line. The lack of these traits during extremely slow pack starts or extended no-starts create anti-climactic jam start sequences. If a team elects to loiter at the pivot line and not start things right away, they’re just delaying the inevitable. The jammer start whistle will come no matter what they do or don’t do. A vast majority of slow starts of this nature that I have observed could have very well started immediately with little difference in initial pack positioning, so why waste everybody’s time by doing it? On the other hand, extended stoppages in a track sprint race happen because both riders try to do everything their athletic skills and strategical brainpower will allow them to do to get what they want. If that means they need to balance motionless on the ragged edge and risk the other guy doing something to spoil their plan, then so be it. This is why the crowd was cheering and getting pumped over two sprinters not doing anything in the middle of the track. The crowd appreciated that anything could happen at any time in that situation. Even if “nothing” were to happen for several moments, they can understand the skill it takes for both riders to stay motionless on the track, especially knowing that it will build to an exciting climax. In roller derby slow pack starts and pack no-starts, there is no physical skill being displayed and there is no risk to using the tactic. This creates no tension, and therefore brings zero entertainment value. The crowd would get an equivalent amount of action and suspense by watching the players on the bench, in other words. Derby crowds aren’t stupid; during the infamous Philly jam non-starts they recognized this and voiced their displeasure. While strategy and tactics are very important in roller derby, my point is that some pack strategies require no athleticism or skill to perform. In true sports, if someone decides to “take a play off” or “phone it in” and doesn’t execute with a high level of skill, they’re going to get burned on a play or their plan will backfire. In roller derby, if one team decides to stall the start of the jam, not only are there no risks involved, many times they’ll receive an advantage for doing so. As I’ve said previously on this blog, that’s backwards to how sports should work. In any sport, the key to beating your opponent is to demonstrate superior skill and athleticism, while executing superior strategies at the same time. But sometimes, derby only does the strategy part while ignoring the athleticism part. You can’t have that if you want a sport that people can appreciate in the long run. It’s got to be 100% of both 100% of the time, not one or the other when it’s convenient for a team to get what they want without earning it. If roller derby is going to want to advance forward and grow, it’s going to need to realize that it’s impossible to go move forwards while doing basic things backwards. Because as we all know, if you try to go forwards and backwards at the same time, you’ll go nowhere at all. Don’t forget in this cycling event you can’t stop where you want or how long you want. They flip a coin to decide who has to go first (there are usually two heats). You must move during the first lap (there is an official walking along and you must have at least his speed). You can’t stand still for more than a minute. They changed the rules when cyclist started to stand still for up to 30′ causing the public to fall asleep. Sounds familiar doesn’t it?